Riva yachts have always been associated with a very specific kind of glamour. At the height of their fame in the 1950s and 1960s they were snapped up by both Hollywood royalty and actual royalty, who made status symbols of the luxuriously crafted Italian boats: film director Roger Vadim gifted the Riva Super Florida Nounours to his then wife Brigitte Bardot in 1959; a Riva Junior acted as the backdrop for one of Elizabeth Taylor and Richard Burton’s torrid love affairs; and Sean Connery bought a Riva Rudy after getting a taste for them while making the James Bond films. Riva has always prided itself on its expert craftsmanship, naval innovation and luxurious attention to detail. It was founded in 1842 on the shores of Lake Iseo in Italy, in the aftermath of a sudden storm that had severely damaged the local fishing fleet. Young shipbuilder Pietro Riva, recently arrived in the area, saw an opportunity to make a name for himself. Not only did he repair the fishing boats, he created what would become an enduring family business that has become a byword for nautical mystique ever since. Each future generation has further innovated the company, with Pietro’s son Ernesto, grandson Serafino and then great-grandson Carlo taking the reins. It was Carlo, in the 1950s, who transformed the boats into luxury icons thanks to his obsessive focus on the finest materials, fittings and finishes. The Aquarama, with its polished mahogany, cushioned deck, retractable roof, wraparound windscreen and swimming ladder, is undoubtedly the most famous of his boats, often dubbed “the Ferrari of the boat world” and produced between 1962 and 1972. Now owned by the Ferretti Group, the brand’s latest modernisation in 2017 takes it into the interiors space with its Riva Boutique. 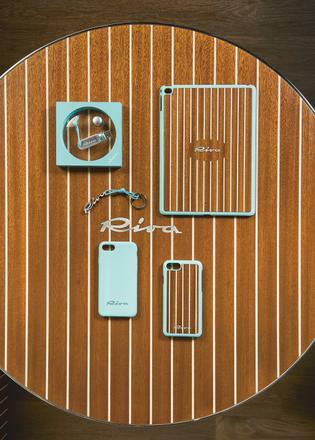 You can now kit out your yacht with accessories and furniture that have that quintessential Riva elegance and feel. 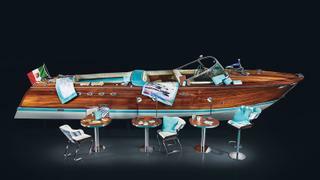 As well as chic ephemera including notebooks, sun hats, keyrings and replica toy boats, there is its interior furniture range, the Aquarama collection, made from the same vintage materials as the brand’s iconic yacht and so calling to mind a bygone era of stylish sea-travel. The Riva Aquarama chair and adjustable height stool both feature a cushion pad and seat back in mambo fabric, the same used to upholster the cushioned deck spaces made famous by sunbathing celebrities in Cannes and Venice in the 1950s and 1960s. Chrome details on the chair and stool legs conjure up the sleek, simple finishes used on the boat’s body, while the graphic shape of the diagonally slanted legs, square seat and chair back are reminiscent of classic boat interiors not to mention the 1960s, when the Aquarama was born. Available in any of the Riva yacht shades, you can easily match your interior to your exterior for a coherent, luxurious feel. Another key piece is the Riva Aquarama table, available in a stylish circular or square shape. 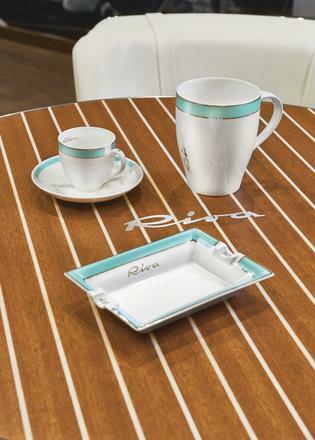 Fashioned from the same mahogany as the boat decks, they feature an identical pinstripe effect, as well as the steel Riva logo inlaid in the centre. They are perfect for onboard use too. So even if you choose not to own a Riva Tritone, Florida or Aquarama, you can still furnish your yacht with a stylish piece of furniture made by one of the most famous and iconic shipbuilders in the world.